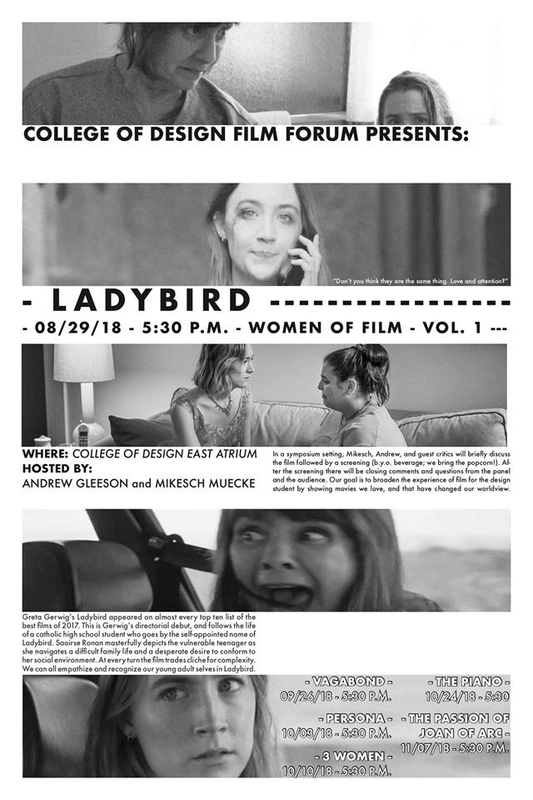 The Department of Architecture presents the College of Design Film Forum on “Women in Film.” This semester, the forum will focus on films about women, by women and starring women. These films, with release dates ranging from 1928 to 2017, break the cliched Hollywood themes of a damsel in need of a man to rescue her from circumstances. In a symposium setting, architecture faculty Mikesch Muecke and Andrew Gleeson, together with guest critics, will briefly discuss the evening’s film, following by a screening. This will be followed by closing comments and time for questions. The goal is to broaden the experience of film for the design student by showing movies the faculty members love and that have changed their world view. Tonight’s film will be Ladybird, starring Saoirse Ronan and Laurie Metcalf and written and directed by Greta Gerwig.